In this day and age, everyone seemingly knows how to put together and hold a garage sale. Yet if this is so, why is it that some people are lucky to gross $150 while others consistently make $1,500 or more from their garage sales? Pick almost any city or town in the country; drive through any middle class neighborhood or residential area on any weekend. You’re sure to spot at least a half dozen garage sales. And what’s being sold at these garage sales? The accumulated “junk” that a lot of people no longer use or want taking up space in or around their homes. Is it hard to hold a profitable garage sale? Not in the least! All it really takes is some of your time, and an awareness of a few merchandising tactics. But to be really prof it able, you must know how, and exercise careful planning. First, let’s look at some of the background. Everyone accumulates items that other people are searching for, and are willing to buy. These items range from discarded or outgrown items of clothing to furniture, tools, knick-knacks, books, pictures and toys. Start by taking an inventory of all the things you have “just taking up space” around your home. Decide which items you’d be better off getting rid of, and make a list of these things. These are the things you are going to put up for sale. And if you are honest about what you really want and need, the pile will grow if you look over your house hold a second and third time! Remember that many garage sale offerings are items of merchandise purchased on impulse, and later found to be no t what the buyer wanted. It is the human condition: We discover too late that we don’t like or have use for things purchased; we “outgrow” in size or taste articles that once fit, or pleased us. You’ll find that many items offered at garage sales are gifts that have been given to the seller, but not really suited to the recipient. In other words, it will be to your benefit, before you stage your first garage sale, to take a week or so to browse through all the garage sales you can find. The problem is, most people just don’t have the time or energy to gather up all the items taking up space around their homes and staging a garage sale to get rid of them. Believe it or not, many people really don’t know how to stage a garage sale; and a lot of people feel that putting on a garage sale is just too much bother and work. This is where you enter the picture. Your enterprise will be an ongoing garage sale of items donated and collected from those people who lack the initiative to put on garage sales of their own. In other words, you can become a “liquidator of people’s junk,” via super garage sales that you promote. We’ve already suggested that you spend a few weeks visiting the garage sales, swap meets and flea markets in your area. Your purpose will be to see what is being offered for sale; what the people in your area are buying, and how the merchandise is being sold. One of the things to notice is how the merchandise is displayed. You’ll also want to notice how the sellers handle customer browsing, and the prices they charge for the merchandise offered. You’ll find most items tagged with a price sticker, but generally the seller is open to either price negotiation or a reasonable offer made by the customer. Begin your enterprise by cleaning out your own attic, closets and basement or garage. Talk with your relatives and friends; tell them what you’re doing, and ask for donations (or at least consignments) of unwanted items. It’s here that you’ll get your first experience in negotiating, and you’ll usually get enthusiastic cooperation. You’ll find people explaining that they really don’t have a use for a specific item, don’t want to keep on storing it, but for sentimental or other reasons, they have just hung on to it. Once you have a little bit of experience, you’ll be able to advertise in the newspaper that you purchase garage sale items, or take them on consignment for a percentage of the final sale price. It’s best that the wife or woman of the house handle the garage sale itself – that is, let a woman be the one who greets the potential customers, shows them around, and generally engages them in conversation. If it’s a woman staging the garage sale, then arrangements should be made for a second one to “mind the store” while she’s out digging up more items for display and sale. And if you are running a really big sale, a second or third per son can be very useful in selling, and just generally keeping an eye on things. The advertising angle is really quite simple, and shouldn’t cost you very much, either. Check area newspapers, and select the one that carries the most ads for garage sales. You shouldn’t concern yourself too much with competition from other ads. People who go to garage sales either go to all of them they can locate, or else only to those within a 3-to-5 mile radius of their homes. To get ideas on how to write your ad, check your newspapers for a week or two. Cut out all the garage sale ads you can find. Paste them up onto a piece of paper – then with a bit of critical analysis, you will be able to determine how to write a good ad of your own from identifying the good and bad features of the ads you’ve collected. Keep in mind that the bigger and better your sale, the bigger and better your “getting started” ads should be. Always remember that in order to increase your profits in any business, you must increase rather than decrease your advertising. At the bottom line, you’ll find that the greatest single reason for a garage sale failing to turn a profit is the lack of promotion and advertising used to publicize it. You should also have an old-fashioned “sandwich board” type sign to display in front of your house when your garage sale is open for business. The purpose of course, is to call attention to the fact that you’re holding a garage sale and are open for business. This will pull in your neighbors, if you haven’t already informed them, and attract people driving by. Sandwich boards are also sometimes set out at key traffic intersections not far from the site of the garage sale. These will attract attention, and point the way. However, check your local ordinances to be sure that this sort of advertising is permitted. Another “sign idea” practiced by a few really sharp operators is the old “Burma Shave” type roadside pointers. Here, you simply make up a few cute sayings (verse or one-liners), write them on pieces of cardboard, tack them onto the power poles at about 200 yard intervals on the thoroughfare leading to your garage sale, and you’re sure to create a lot of traffic for yourself. People are amused by, and drawn to people who do something a little different, unusual and creative in promoting a sale of any kind. To come up with some cute verses, simply visit your public library and check out a book on limericks. Adapt the ones that you feel are most humorous, and start making signs. Again, a word of caution before you get too deeply involved: Be sure to check your local ordinance before you start nailing signs to power poles. By all means, search out and use all the free bulletin boards in your area. It’s better, and usually much more profitable to take the time to make up an attention grabbing circular you can post on these bulletin boards, than just to use a scribbled 3 by 5 card announcement. Pick up some -transfer lettering;” go through your newspapers and old magazines for interesting illustrations, graphics and pictures; then with a little bit of imagination and flamboyancy, make up an 8 1/2 by 11 poster announcement of your sale. When you have it pasted up take it to any quick print shop and have them print up 50 or 100 for you. Your cost for this small print order should be well under ten dollars. If you make this circular/poster up with versatility and long-time usage in mind, you can use it over and over again simply by pasting on a new date. In case you feel “left-out” when we talk of “pasting-up” things, this simply means pasting a piece of paper onto the overall page you’re putting together. Say you have made up your circular with a date of Wednesday, May 1st, and want to change it to read Thursday, July 16th. Rather than do the entire thing over, simply write out a new date with your transfer letters on a separate sheet of paper, cut this out to fit in the space occupied by the old date, and paste the new date over the old date. The artwork master is now up to date; the printer does the rest. Incidentally, this is precisely what is meant in mail order and other dealership offers where they furnish you with the basic advertising/promotional material and advise you to “paste over” their name/address with your own. For paste or glue, drop by just about any stationery store and pick up a tube of “glue stick.” This is a small tube of paste, about the size of a tube of lipstick, generally sold for less than one dollar per tube. The tube glue stick works much better than regular glue or paste, and is not as messy as rubber cement. Your signs have to be effective, but you have to remember to keep them simple. Don’t try to cut corners on your signs. Signs announcing and pointing the way to your garage sale should be placed at each intersection within a one mile radius of your sale location. If it takes 50 signs, then make 50 signs. The important thing is to let people know that you’re holding a garage sale. Signs can be made simply by cutting and using the sides of cardboard boxes, and writing on them with a heavy felt tip marking pen. Make it easy for your signs to be seen, and for people to read what’s on them. About all you really need is great big block letters reading “GARAGE SALE,” with the street address, and an arrow pointing in that direction. Don’t think for a minute that people are going to stop and read a lot of “stuff” you’ve written on your sign when they are driving by; you just want them to see your sign and proceed in the direction necessary to reach the location of the sale. They’ll be moving by your sign too fast to see or read anything else you may have written. The ads you place, the bulletin board announcements you post, and the signs you put up will bring many people to your garage sale location. A lot of people will drive by slowly and just look, but most will stop to browse around. But you still have to contend with the huge number of people who just drive by without stopping. So, let’s talk about the “inside secrets” of drawing people into your sale, and the merchandising gimmicks that will result in the maximum number of sales for you. You must call attention to your sale. Don’t be shy, bashful or self-conscious about let ting everybody for miles around know that you’re having a garage sale. If you could afford to get the Goodyear Blimp to “hover” over your garage sale, then by all means, you should do it! Some sharp operators do the next best thing. They rent miniature blimps, send them up above the housetops, and tether them there on their sale days. Of course, this giant balloon or miniature blimp has some sort of sign on the side of it, inviting people to your garage sale. This is one of the strongest available advertising ideas for pulling traffic to a sale of any kind. For more details, write Pie-In-The-Sky Company, PO Box 5267, San Mateo, CA 94402, or explore to see if there is a local outlet for this kind of advertising merchandise for rent. You have to give your sale some flair. Put some posts up across the front of your property and run some twisted crepe paper between them – or better than crepe paper, run brightly colored ribbons. Invest in some colorful pennants and fly them from temporary flag poles. And don’t forget the balloons! Make your garage sale a fun kind of event, with clusters of balloons anchored to your display tables and racks. Be sure to “float” them well above the heads of your customers as they’re browsing through your merchandise displays. Cover your display tables with colorful cloths. Don’t hesitate to use bright colors and busy patterns. Regardless of what you sell, effective display (packaging the event) is still absolutely essential to your success. The secret to outstanding garage sale profits is in having the widest or largest selection of merchandise. And part of the process is taking great care in displaying and labeling your merchandise. You cannot simply dump items haphazardly on a table, sit down, and expect to realize great profits. The people doing the most business and holding the most sales are the ones with interesting displays, action and color. Have as wide a selection of colors as possible in your clothing racks, and mix them for “rainbow” effect. Make sure that your jewelry items shine and sparkle. Arrange them in and on jewelry boxes, jewelry ladders and other items sold for the purpose of showing off jewelry while keeping it neatly organized. Some people have even gone so far as hooking up battery operated lazy susans and arranging their jewelry on these. Having the jewelry slowly turn on the lazy susan will not only catch the eye, it will catch the light, making an attractive display even more attractive because it sparkles and gleams. Think about it, and then study the methods of display used by the “rack jobbers” in the stores in your area. These are wire racks that usually hold card packaged items. Such a rack or kind of display would lend itself beautifully for anchoring a cluster of balloons. Keep these things in mind, and build your individual displays as part of the whole. Make it pleasing to the eye as well as convenient for your customers to browse through and select the items that appeal to them or catch their fancy. At many garage sales, some of the merchandise (particularly the clothing) is dirty. Notice this when you visit other people’s garage sales, and then take it upon yourself to make sure that every item – positively everything you show – is clean and sparkling bright. A bar of soap, a bucket of water, and a few old rags will do wonders for shop tools, garden equipment and bicycles. The same goes for furniture polish on old furniture, and a run through the washing machine for all washable clothing. It is advisable to determine a price for each item before you set it out for display. Then mark that price on a price tag, and attach a price tag to each item. Your prices should also always be rounded off to more or less even numbers such as: $.25, $.50, $1, $1.50, $2 and so on. In other words, don’t ask for $.35, $.95, or $1.98, or any of that sort of pricing. Almost needless to say, you should always mark everything up by 100% of more. In other words, if you have acquired a particular item for $l, set a price of $2 or more on it. It’s also a good idea to mark up your asking price from the bottom-line price you’re willing to accept. Basically, the price marked on the price tag at most garage sales is taken as the starting price fro m which the buyer and seller negotiate. Most garage sale promoters price their cheaper items at the bottom line price they will accept, and don’t deviate from those prices as shown on the price tag. Then on the more expensive items – $2 and over – they mark up their asking prices by 20 to 40 percent and use that margin for negotiating with the customer. Before you open, of course, you will have done your homework and know the value of each item of merchandise you have for sale. Don’t ever take a customer’s “claimed” value of an item. By the same token, don’t listen to a seller, when you’re buying items for your sale, when he claims that he’s offering you an antique or price less treasure. Sometimes (rarely enough) you’ll be able to pick up fantastic treasures for virtually nothing; so by knowing your merchandise, you’ll not let “the flag that Betsy Ross made” slip through your fingers for a song. Be sure to have all possibly really valuable items appraised by authentic dealers. These people are listed in the yellow pages of your telephone directory. Some of the “extras” that contribute to the success of a garage sale include: Plenty of change, because without proper change, you’ll lose a great many sales. A tape measure, because you’ll find people often want to know the exact dimensions of some thing (especially furniture) in order to fit it into a certain space they have in mind. Long extension cord and electrical outlet, because your customers will want to “plug in” and try out the mixers, vacuum cleaners, hand tools, or other electrical appliances. Back for a moment to drawing in those “cruisers” who aren’t quite sure they want to park their cars and come browse: Look for some kind of interesting or unusual item to call attention to your sale – something you can set up or park in front of your home during your sale. Some of the displays we’ve seen along these lines include a horse-drawn surrey; a restored Model T; an old farm plow. Anything of an unusual or interesting nature will do the trick for you. One couple we know put up a display using a manikin dressed in an old-time farm bonnet, long dress and apron. This display depicted a farm woman of old, washing clothes with a scrub board and two steel wash tubs. It’s not hard to believe, this display really drew the crowds, and crowds always mean sales! Go wherever your imagination takes you; you have to be different and distinctive. 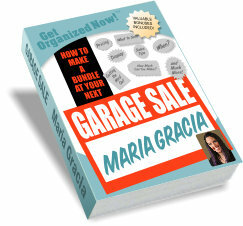 You’ll get lost in the hundreds of garage sales going on all around you if your sales look like the next half dozen. If you’ll take the time to employ a bit of imagination, and set your sales up with the kind of flair we’ve been talking about, you will not only draw the crowds; you’ll be the one reaping the most profits. As you think of beginning this garage sale business, remember this: It’s almost a compulsion with some women to go shopping – to search for interesting, and sometimes rare and valuable items. This fact alone will keep you as busy as you ever want to be, staging and promoting garage sales. The market is so vast, and the appetite so varied, that anything from a brass bedstead to a used diary of someone’s long-forgotten grandmother will sell, and sell fast, at garage sales. Put it all together, use a little imagination, and you’ll succeed in a very interesting, challenging endeavor!